Tobolowsky, Andrew 2018. Israelite and Judahite History in Contemporary Theoretical Approaches. Currents in Biblical Research, Vol. 17, Issue. 1, p. 33. Kalimi, Isaac 2018. Writing and Rewriting the Story of Solomon in Ancient Israel. Hughes, Aaron W 2015. The politics of biblical interpretation: A review essay. Critical Research on Religion, Vol. 3, Issue. 3, p. 282. Kelle, Brad E. 2015. The Wiley Blackwell Companion to Ancient Israel. p. 176. Pioske, Daniel 2015. Retracing a Remembered Past. Biblical Interpretation, Vol. 23, Issue. 3, p. 291. Of all the Bible's personalities, David is the most profoundly human. Courageous, cunning, and complex, he lives life to the hilt. Whatever he does, he does with all his might, exuding both vitality and vulnerability. No wonder it has been said that Israel revered Moses yet loved David. But what do we now know about the historical David? Why does his story stand at the center of the Bible? Why didn't the biblical authors present him in a more favorable light? And what is the special connection between him and Caleb - the Judahite hero remembered for his valor during the wars of conquest? 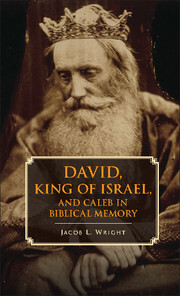 In this groundbreaking study, Jacob L. Wright addresses all these questions and presents a new way of reading the biblical accounts. His work compares the function of these accounts to the role war memorials play over time. The result is a rich study that treats themes of national identity, statehood, the exercise of power, and the human condition.